I needed quite a hearty second dish...and I only had two ingredients on hands...shitake mushrooms and eggs. 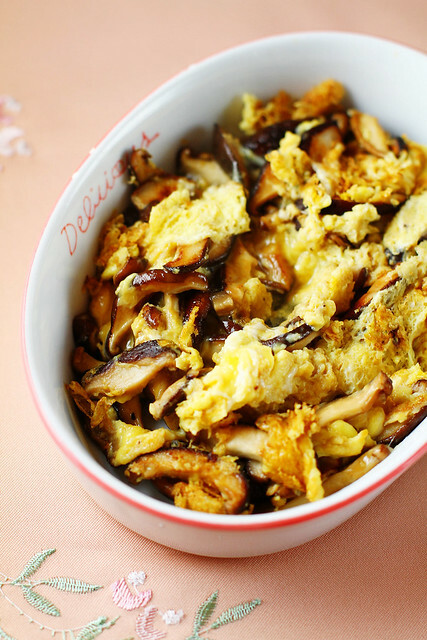 Earthy, rich flavored mushrooms with soft, smooth, runny eggs and some smoky, crispy browned egg bits...easily yummy. Shitake mushrooms and eggs, I have not tried but with button mushrooms, yes! Easy to do and yet so tasty! This is something I would not have naturally thought of, but "necessity is the mother of invention," as they say. It looks quite tasty! This is new to me, I have yet to try scrambled eggs with mushroom. Looks great! "Make the max out of the min" I like that!